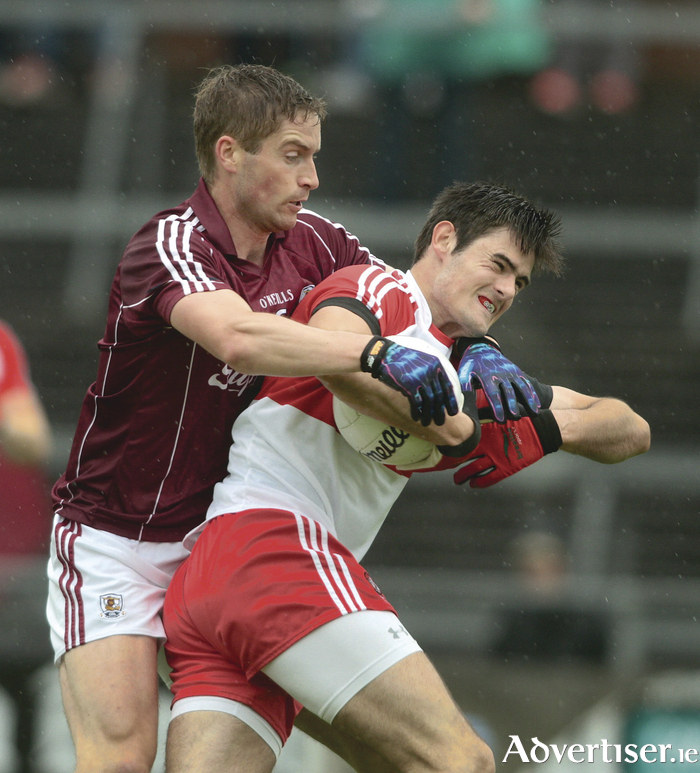 The Galway footballers produced a solid workmanlike performance in horrible conditions at Pearse Stadium on Saturday evening to deservedly beat Derry by 1-11 to 0-8 in Round 3B of the qualifiers. As a spectacle, the game was tough enough going, but the Galway players, management or supporters will not mind that. It was fantastic to get another win under the team's belt, following the Armagh success, and set up a clash with 2012 All-Ireland champions Donegal. Derry played a defensive game from the outset and raced into an early lead. However, Galway benefitted from a few frees and dissent from the Derry players to lead at half time by 0-8 to 0-5. Wing-forward, Gary Sice was Galway's star performer in that half and the Belclare man showed some terrific leadership and nerve to slot over five frees. When the game seemed to be drifting away from Galway in that first half, it was Sice who won a kick-out or two, and ripped into the Derry rearguard when in possession. Sice is playing with great gusto at the moment, and he also chased back to win a vital ball in the full-back line in the second half. He was Galway's most influential player last Saturday. Others to impress were the entire half-back line of Liam Silke, Gary O'Donnell and a rejuvenated Gareth Bradshaw. Silke did splendidly to support help set up Danny Cummins for the only goal of the game, while both O'Donnell and Bradshaw hit fine points, with the Moycullen man's effort just before half time one of the scores of the entire weekend. O'Donnell has his critics, but he produced a sterling display all through the game. He showed real power and read the game well. Both Tom Flynn and Fiontán ÓCurraoin also did some good things, with the Breathnach's man breaking some good ball and making a few good runs into the Derry rearguard. With their aerial advantage, youth and serious mobility, those two men should fancy their chances against any midfield opponents if they rattle into them. Danny Cummins worked really hard and, aside from his goal, he possesses an immense appetite for work. He won what was a dubious enough, but crucial free in the second half that broke Derry's momentum and gave Gary Sice a nice tap over free. It was a key moment in the whole game. Cummins might not be as ruthless as we would like in front of goal all the time, but no one can question his commitment to the cause. Apart from one stunning free-kick from the side-line in the first half, team captain Paul Conroy did not have much to show for 65 minutes of hard graft. Hopefully the St James' man will really kick into top gear on Saturday week in Croke Park. Galway will need him, and Damien Comer, Michael Lundy and perhaps Shane Walsh on full throttle if they are going to trouble last year's beaten All-Ireland finalists. Team manager Kevin Walsh was pleased with the effort and work rate of his players. He and his management team have produced a positive team spirit in the pane, epitomised by their hard graft for the full 70 minutes. The team is defending well and in numbers, and has only conceded one goal in five championship games this year which is top stuff - and that goal was the daft one against Mayo. We will preview the Donegal game on these pages next week, but the bookies have Galway as 5/2 outsiders to reach the quarter-finals, with Rory Gallagher's side at 2/5 to reach the last eight. The last time the sides met in championship was in July 2009 when the Ulster men won by 0-14 to 0-13 in Markievicz Park. Colm McFadden scored 0-6 and Michael Murphy hit 0-5 for the victors and Galway's top scorers were Michael Meehan (0-4 ), Seán Armstrong and Mattie Clancy 0-2 each. That was six years ago and Galway have a load of new players on their squad now. Maybe some of Galway's new younger guns will fancy a run on Gallagher's men and surprise us all?